Dog's Mercury is an extremely poisonous plant and when eaten it has been known to cause vomiting, jaundice and coma. Beware, therefore: this plant can kill! Dog's Mercury is dioecious (male and female flowers grow on separate plants). Its primary method of spreading is via undserground rhizomes.The male flowers are small catkins, while the inconspicuous female flowers have three tiny tepals. The simple serrate leaves are mid-green in early springtime and turn a darker shade of green as summer approaches. This low-growing shade-loving plant covers the floor of some deciduous woods in springtime; it is also found in hedgerows and on some areas of limestone pavement. Dog's Mercury flowers between February and April. The common name arose because this plant was generally considered to be of little or no worth - a 'dog's' plant is one considered to have no medicinal uses. The genus name Mercurialis refers to the god Mercury, son of Jupiter, while the specific epithet states that this is a perennial plant. This perennial plant is common and widespread in woodlands in southern England and Wales but much less so in Scotland and Ireland. It spreads at a considerable pace and, as a result, often crowds-out other (more attractive) woodland species. This plant is also present throughout much of northern and central Europe including France and Slovenia. Annual mercury is a weed that grows among crops in fields; it is very similar in appearance but it is not a perennial plant. 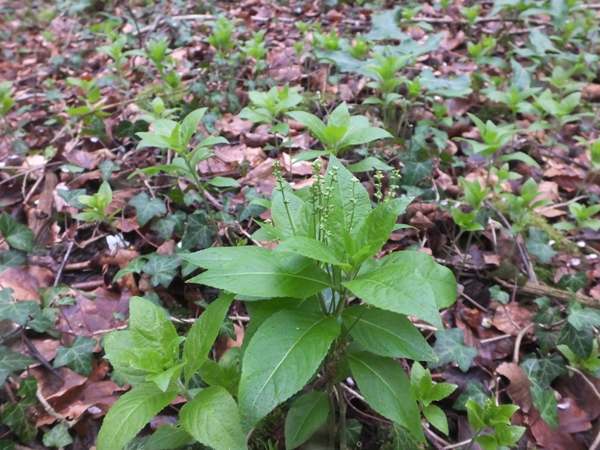 The Dog's Mercury plants shown on this page were photographed in woodlands in France.